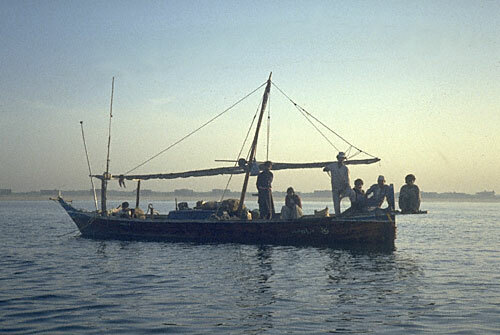 Traditionally, boats used a lateen (triangular) sail. However, now the primarily means of locomotion is the side-mounted motor-propeller system. Trolling operations are time-consuming and the boat is driven back and forth within a relatively confined area with lures and hooks trailing behind the boat. This boat is a Sindhi-style vessel and was one of the few I saw during the summer of 1994 that still retained its sails and masts in place. Sails are sometimes used to conserve fuel use during trolling operations for large predatory fish, but more often than not, the sails are no longer in use. During the 1970s and 1980s, most of the boats used sails. Conversion to side-mounted outboards comes at a heavy price to the fisherfolk as they become indebted to the fishmonger who controls the fish transport and price structure in Buleji. For example, during the winter, when fishing is lean, the fisherfolk are dependent and become indebted for fuel to check their nets. By the time the productive fishing seasons of the summer come along, the fisherfolk are required to sell their fish to the fish monger at a reduced price in order to settle their winter fuel debts.